If you're looking to expand your crafting talents, or pick up a new artsy hobby, East Williamsburg's Better Than Jam has you covered. Better Than Jam has crafty classes including a variety of screenprinting workshops, and there's something new happening in the studio nearly every day of the week! Better Than Jam has a long history in Bushwick. Owner Karin Persan opened her store in 2010, originally located at The Loom on Flushing Avenue. In 2015, Persan moved Better Than Jam to Grattan Street in East Williamsburg to accommodate her growing studio and class offerings. It's safe to say that Better Than Jam has had to make room to grow. "I've been open since 2010, and I started hosting local people who hand-made their stuff. I was there [at The Loom] for six years, and I moved over here [to Grattan Street] in 2015. This is, like, the dream space," said Persan. 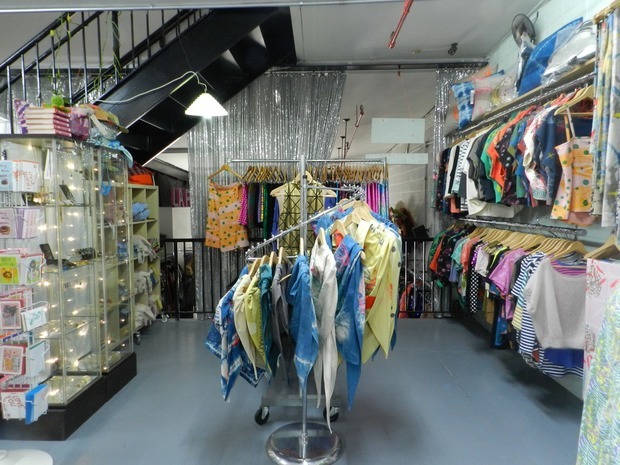 To occupy their new multi-story space, Better Than Jam has teamed up with Bushwick's favorite glam and drag boutique, House of La Rue. "House of La Rue just moved in two months ago," Persan explained. "We have a lot of mutual friends. They came in to be an extra crutch for running this space ... They're really good at retail. They're fun and I love the shop and being able to support people who make cool stuff." In addition to hosting and teaching classes, Better Than Jam sells clothes, home goods, and art from local vendors and artists. Local artists can also take advantage of Better Than Jam's ample studio space and private studio rooms. "I've been [in the neighborhood] for 10 years and everybody's apartments get smaller and smaller, and their creative spaces are just disappearing," said Persan. "So when I got the opportunity with the space and the building, I wanted to share it." Unique shop stocking locally made apparel, accessories, housewares, and other items. Follow Better Than Jam on Instagram, and like the shop's page on Facebook, and visit Better Than Jam's online store here.